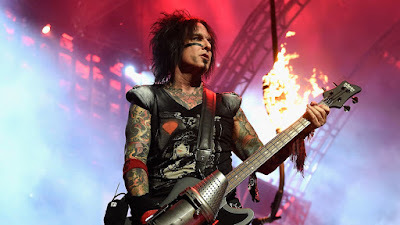 MetalRockNews: Nikki Sixx about keeping fit on the road: "You need to stay energized for your family"
Nikki Sixx about keeping fit on the road: "You need to stay energized for your family"
Nikki Sixx was recently interviewed by "The Scotty Mars Show", you can read some excerpts below. About if it's hard for him to get some gym time in on a regular basis while he is promoting SIXX:A.M.'s upcoming double album, "Prayers For The Damned", Sixx said: "Well, I haven't… In this last two weeks, it's been all bread and coffee. [Laughs] I'm thoroughly exhausted, but, you know, if you wanna take your message to people, you can't always ask people to come to you. And we said, 'Let's get out and let's meet people and do interviews and do television and do photo shoots.' And it's exhausting. It's a lot. Some days, we're doing twenty-five [or] thirty-five interviews a day… you know, you multiply that by two weeks. We got to talk to a lot of people, but more importantly, we get to tell people what we're about to all their listeners or readers, etc. etc." He continued: "It's hard when I'm on the road; I obviously don't have the same luxury I do at home where I can go to the gym five days a week. But I do make it part of my daily, you know, thing that I have to do. I need to stay fit, I need to stay energized, and it does fight off depression. You know, we get very lonely on the road — very lonely. I'm married. I have kids. I've got three dogs. I love my life. I'm monogamous. Obviously, my history is not that. But I'm not my history. And, you know, you need to stay energized for all that — for your family and for your wife and everything, so you have to stay positive in your head."